Only the mater is extant. The limb is soldered to the back plate, shackle and suspension ring. 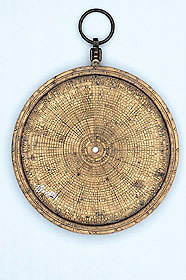 The inside surface has a radiating table of numbers for calculating the conjunctions, oppositions and eclipses of the sun and moon, constructed for the Spanish town of Zaragosa and the dates 1558 to 1570, as stated in an outermost inscription. The limb has a degree scale 0 to 360, divided to 10, subdivided to 5 and to 1, numbered by 10, and a scale of hours numbered I to XII twice. The rim of the limb is marked with the classical names of the 12 winds. On the back are a set of 13 concentric scales. The outermost is a scale of degrees 90 to 0 to 90 to 0 to 90, divided to 10, subdivided to 5 and to 1, numbered by 10. Then a zodiacal scale with names and symbols of the signs employing the same degree scale for each 30-degree section. There is a circle for the positions of certain stars with their magnitudes indicated, then three circles of planetary symbols allocated to the zodiacal signs, and then a calendar scale, with the names of the months in Latin, each divided to 10, subdivided to 1, numbered by 10 as appropriate. The first point of Aries is at 101/2 March. In the central space, the lower half is occupied by a projection of the celestial sphere. One of the upper quadrants has a shadow square with scales 0 to 12 to 0, divided to 3, subdivided to 1, numbered by 3, marked 'VMBRA VERSA' and 'VMBRA RECTA'. The other quadrant has an unequal hour diagram, with the numbered hours divided to 20 minutes, and lines for solar altitude every 5 degrees, numbered by 10. This quadrant has the inscription 'RECTIFICATA ? ANNO ? XPI ? 1558'. See R. T. Gunther, The Astrolabes of the World (2 vols, Oxford, 1932), vol. 2, pp. 312-5.